Does anyone not like David Beckham? Just what is it about David Beckham that has football fans the world over worshipping him? David Beckham's commitment and obvious love of playing has ensured he remains a worldwide football icon. From Europe to the United States, Asia to Africa, Manchester to Milan via Madrid, the England midfielder is a worldwide football icon, claiming a status that appears to be out of sync with his effectiveness on the field. It has not always been that way. Castigated by fans and English media alike following his sending-off against Argentina in the 1998 World Cup finals, for a while Beckham was public enemy number one in his home country. He was seen as a good-looking Flash Harry, too preoccupied with fashion, hairstyles and his pop-star wife Victoria. Beckham always attracted headlines in his younger days. Some good - for his superb free-kicks and wholehearted performances on the pitch - and some indifferent, for a sometimes petulant attitude. But while hard-line club manager Alex Ferguson grew tired of the media circus that followed his number "7," resulting in his eventual departure from Manchester United to Spain in 2003, for England Beckham could do no wrong. His dismissal against Argentina, which prompted such vitriol and hate, gradually became nothing but a distant memory as Beckham began to turn jeers into cheers with some dynamic performances while wearing the "Three Lions" shirt. This culminated in perhaps the finest moment of his career, when a pumped-up, super-charged Beckham dragged a struggling England team up by its bootlaces to secure a last-gasp draw over Greece and ensure qualification for the 2002 World Cup. Without the intervention of Beckham's stunning 93rd-minute free-kick, England were staring at World Cup humiliation. The fact that the match was being played at Old Trafford only added to the theatre. And that was it... the nation was hooked, a hero was born. In fact, in such high regard is Beckham held that he is now viewed by the English as a national treasure, sporting royalty, a very public figurehead for England's World Cup bid of 2018 ... which, with delicious irony, falls exactly 20 years from the date a perceived arrogant mop-haired young pup kicked out at Diego Simeone to get sent off in St Etienne. Supporters are not stupid. They can see when a player is trying his hardest, putting in that extra shift, working tirelessly for the cause and Beckham has done this throughout his career. At Real Madrid he fitted in perfectly with the "Galactico" era. Although the club were not successful on the pitch, Beckham was adored by the Los Meringues faithful for his all action style and dead-ball expertise. The same at the San Siro, where his appearances from the substitutes bench still create a murmur from the Milan "Tifosi." And although Beckham's initial spell with the LA Galaxy did not get off to a perfect start, he won those fans over too, helping the club reach the MLS final. Beckham's popularity is unique because it straddles different time zones for different reasons. In England, it is for his whole hearted performances for the national team, which has seen him win more caps than any other outfield player. In Italy and Spain, for his displays and attitude with two of the biggest club sides in the world. And in south-east Asia, where he adorns many teenage girl's bedroom wall, it could be argued that his model good looks have propelled him to god-like status. Rare is a man who has a fan base throughout the world that envelops young and old, male and female, black and white... but David Beckham has it. Hard work, charm, good looks, politeness that help make the both man and the persona. But, you know what, giving 100 percent every time you step out onto the field of play is the real key. As I said earlier... fans aren't stupid. I don't like him, I think he's soft, overrated, and washed up. All that he has ever had was the ability to place a ball great when no one is moving. I think you very, very, very much overestimate his popularity. "Once it's in print... its true!" ? You said it all. Becks' achievements on and off the field are phenomenal. The media unmade him earlier and they made and are still making him now though. No, I am not a fan and never have been. He is quite useless at football and lazy, except for when he is "given" a free kick. this article wasted my time. He is not worth it. I don't like him. My Goodness!!!!!!! Whoever don't like Beckham these people really don't have a taste of sportsmanship!!!!! Wake up Guys!!!!!!!! David Beckham has been one of the best sportsmen in this world and has ruled the soccer field!!!!!!!!!! Keep it up Becks!!!!! Cheers!! What's to hate? If he had a personality, maybe there'd be something to dislike. I think he is overrated and i don't see any impact that he makes in a soccer game. After all he made a name for himself by doing long goal kicks and scoring. He is better of modeling and i think he should retire now his days are over. The writer is spot-on with his analysis. Those who doubt the accuracy of this article need only look at the endorsments Beckham commands, the front covers of global magazines, the incessant digital media that Beckham generates wherever he goes and whatever he does. the guy is great that's why people keep talking about him good or bad, he'll continue to be relevant any day on and off the field of play. Can't stand him... over-rated, over-payed, over-hyped. He is quite possibly the WORST thing that ever happened to soccer in America. Just because some people think he's nice to look at doesn't make him a truly great player. It takes a LOT more skill, dedication, and work ethic than he has to achieve that status. Well, liking him or not does is to me not making a difference. He played for the best clubs in Europe. He had one of the best football coach who praised his talent. Yet, he is still playing, part of the start 11, and performing well with AC Milan.These are facts. I don't think an over rating player would have lasted that long. A real star! polite, smart, hardworking and talented. Best wishes from Sri Lanka. You can tell that you are on an American website when you see an article about Beckham as an actual football icon. Same reason why everybody in America thought they got a good deal by getting him to play in the MLS. He was, maybe, a good player, but not the best, not an icon. He had fans, yes, but not as much as some football stars now. And I speak in the past because yes, he is old! Don't you get that his career is over? His peak was in the 90's, and he is only staying there because of his "popularity" in non-football lover nation. He was and still is way, way, way overrated in the US especially. Me. I don't like him. He can play football but apart from that he doesn't know what to do with himself. I don’t like him. He is a good free-kicker but that is not enough. There are lots of better midfielders and his laziness does not help him either. Overrated by the media. This article proves it. The most overated player... ever. he is not beautiful.. not a great player, mediocre, ( Donadoni, Totti play much better...) it's a creation for the English worshiping attitude of success and money... AC Milan? Do you know how many players AC Milan has been wrong in choosing? It's a symbol of how much the image hides the quality. Those of you who haphazardly tried to blacken or dismiss Beckham are clearly jealous and have no real sportsmanship qualities. If you can't recognize the 100% he gives every game you are just blinded by your ugly green state of mind. The man is to soccer what Michael Schumacher is to Formula 1. And by even suggesting that he was given a free kick just goes to show you have no business commenting because all you are doing is insulting the teams he's played against as-if they just decided, hum Beckham has the ball, let's let him score! And another thing, it really irritates me that people like you can spew such hatred, it such a shame that you can't turn that energy into something positive that might actually benefit the greater good. This man is a man that see opportunities and took them and best of all with integrity. Some of you who say that he's not the best, you clearly don't know your history and haven't seen "all" of his games. And one more thing, the guy is a team player and he gives full credit to everyone on his team, that's a sportsman that kids can look up to. Oh and for his private life and interests, again if you have time to hate then you have no business being on the Internet and you really need to reevaluate who you and focus on improving your obvious flaws. Beckham, keep playing until you can't and keep being the great husband and father that you clearly are. No reason to dislike a guy that gives all, is polite, and seems honest. So you haters...why exactly do you dislike such an human being? I wonder. yes a good sportsman and yes a good person, but never liked him because of the overhype by the u.s. media. ten years ago he was the best player but his skills have greatly diminished. his overhype and celebrity in the u.s. has hurt other players that could have been stars by overshadowing them. he has not done anything wrong except followed the money, which i can't blame him for. he may be a good person, but many people, including me, don't like him. Well said Annalisa!!! !, you need to know a player's history (Caps, goals, national and european championships) before making the kind of comments that have been written here. The guy may not be a Pele, Zidane, Ronaldo, C. Ronaldo, Messi or Rooney but he has always played with energy, passion and commitment, and that are not traits that are thaught on the pitch, those have to come from you....the person...carry on Becks!!!! He is on paper what you media have made him to be. But on the field he is not and WILL NEVER BE remembered as a Zidane, Pele or Maradona. The reason he is popular is that media give him more attention than he deserves for whatever vanity driven and easy content media can produce regarding his private life. 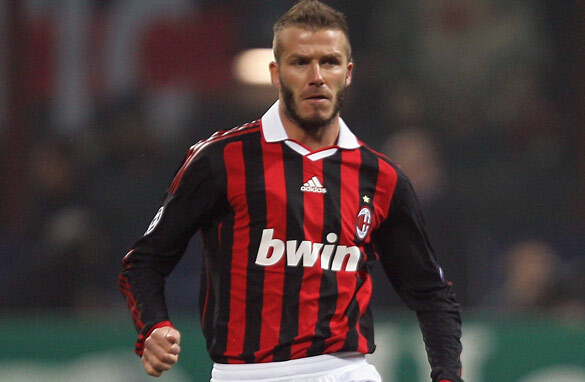 Becks gives 110% every time he plays, whether it be for A C Milan, England or L.A. Galaxy. Anyone who bothered to watch him would know that. The standard of his game is still first class and there's not a team in the world who wouldn't be proud to have his services. what he does best, playing football. him what he is, and fans remained loyal to him. He's a backup on a US team. That's childs play. Talentless these days. How could I say I like him or not – when I do not actually know him? People are wayyy to quick to accept an image consultant's plan or the media stream. Could be a nice guy away from the public or he could be that dude that drinks all your beer and doesn't turn on the bathroom fan. I don't believe he will be remembered as a football icon but as someone who really wanted to be "famous" and was in the spotlight who happened to play soccer at some point. He is a Legend.. take it or leave it.... He rules UK with style ! players could learn from him. I think Becks is alright. I'm not obsessed like people I have met in Japan, but he does bring something to the game that maybe a few other players haven't. He's not the best all-around player I have seen. Sure he hits free kicks with great accuracy and he is an exceptional crosser of the ball. However, in my opinion he has never been the type of guy you could turn to so often when a match is on the line. Of course he's had his moments. I remember how he brought ManU back in to the match against Real Madrid in the Champions League (I think that was 2003) even though they lost in the end. I think he's going to be known more for his style off the pitch than for what he did on it. He's a good player, but there is a huge difference between good and great. Becks is cool,i like him so much!he s a great face to English football!ZIDANE said he treat people the same whether you are pele or the common ball boy! David Beckham is still very very good with the dead ball. As he readies himself to take free kicks one can notice panic and confusion in the rival box. The top quality deliverer of the ball imparts spin, packs appropriate weight, flight and direction in his kicks. Not many are able to put so many ingredients in the attempt. I read these comments about how Beckham was / is 'good but not great', how he is lazy, etc and it is as if I am watching ESPN commentators espouse the values (or lack thereof) of Mr. Beckham and all the time displaying a complete lack of knowledge of both the game and Mr. Beckham's football credentials on the world stage. I have grown use to such trite, uneducated, and downright ignorant comments over the years where Americans and the game of 'soccer' is concerned but please, PLEASE refrain from further embarrassing yourself (CNN, ESPN, and the multitude of commentators 'out there) by saying that Mr. Beckham has no skills, is past his best (ESPN has been saying that for years) and that he simply managed his career according to the clubs he played for, his apparent good looks, and the efficiency of the PR firm representing him! Mr. Beckham was / is a great player and has played for some of the worlds best football clubs which is no small feat of accomplishment in of itself; 'greatness' is not defined simply by his football skills (though certainly his skills are prodigious) but also how he leads the team (domestic and national), how he raises the bar in professionalism, how he brings passion to each game and finally how he raises the level of engagement of the fans to unprecedented levels. Mr. Beckham is the consummate professional with skills both on, and off, the field to support the claim that he is indeed a great player. I look forward to reading more of the same inane, ill-informed and quite frankly ignorant comments regarding the 'lazy, talentless, and overated' player that you are so well positioned to provide an opinion . . . Being an aging football player now doesn't make him talentless. He cannot have the same level of fitness as he used to have. How anybody can call him lazy I just don't know. Maybe because in that match against Greece he was the team and seem to do the work of 11 men – he was all over the pitch. But he can't be expected to carry the whole team everytime – specially not now at his age. Also you don't get that good by being lazy – it takes practice and lots of it (even if you are gifted in the first place) – it isn't magic. He also showed a lot of guts to come back after the vitriol directed at him in the UK after France 98. I think that shows his character. So he is making lots of money off the pitch and likes expensive things – who wouldn't jump at the opportunity to secure a luxurious future for yourself and your family. MEN I CANT BELIEVE SOME PPL ARE TALKING NONSENSE ABT BECK, FOR HEAVENS SAKE THIS IS JEALOUSY. DAVID IS AN EXCEPTIONAL PLAYER IN THE SOCCER WORLD, U CANT COMPARE HIM WITH ANYBODY, HIS STYE OF FOOTBALL IS A UNIQUE, COS NOBODY PLAY HIS STYLE. MESSI PLAY LIKE MARADONA, OR TEVEZ OR AGUERO, RONALDO PLAYS LIKE AUSTINE JAY JAY OKOCHA, AND A HOST OF OTHERS, BUT DAVID, HIS FREE KICKS, HIS CROSES, HIS PASSES, NOBODY DOES IT THE WAY HE DOES, HE WOULD HAVE WON WORLD BEST OR EURO BEST IN 1999, BUT I THINK HIS ATTITUDE ON THE PITCH COST HIM ALOT THEN. LET ME ASK THIS QUESTION, HOW COME HE PLAYED FOR D THREE BIGGEST CLUB IN ENGLAND, SPAIN AND ITALY IF HE IS NOT GOOD. The greatest thing attributed to Becks is qualifying England for the world cup - pathetic! He is a great BRAND, but this brand was not achieved on the pitch, but in the pages of OK, People etc. If greatness is about giving your all, then i submit that GATTUSO is the greatest player in the world. Becks is to football what Sharapova is to Tennis!! As a person he might be great, as a footballer he is mediocre at best. Let us also squash all this talk about the English team missing his experience in the world cup. What experience? He has never played in a semi finals for the 3 lions, so where is the experience coming from. That being the case, let Brazil recall Romario, Roberto Carlos, Cafu, Ronaldo (chubby). Please save us this discuss and let Becks go to HOLLYWOOD - thank you to the great Simon Fuller! !